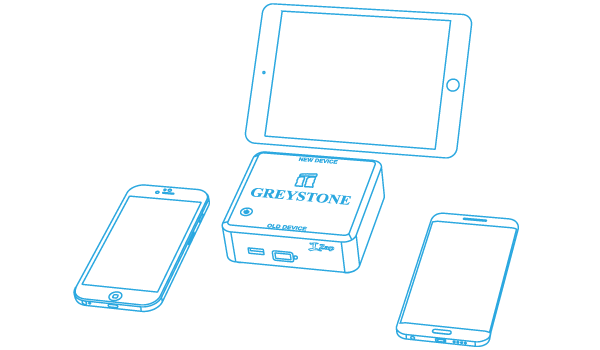 Greystone Data Technology engineers the most advanced and powerful tools in the industry, ensuring quality and results. 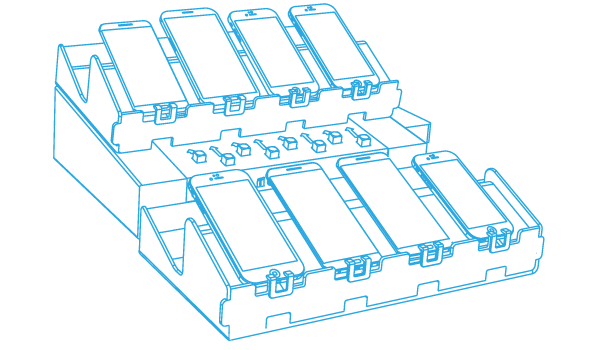 The AIO is an advanced all-inclusive mobile testing platform designed for use in warehouse or production environments. This system is very versatile and scalable for any size of operation. The AIO is able to receive mobile devices into your Warehouse Management System (WMS), test the full functionality of a mobile device, remove and sanitize all data from the mobile device with data erasure solution has been certified by ADISA. One machine does it all. All information about the device, tests, and content sanitization is maintained in an off-site database the customer may access at any time. This gives you end to end reporting of devices at the IMEI level. One computer can support up to 4 Icombine (hardware) modules. 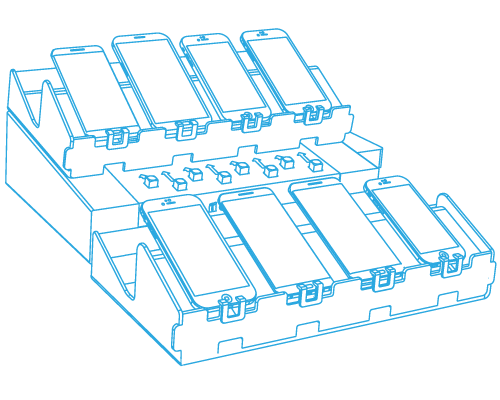 Each Icombine module can support up to 8 mobile devices at one time. Our system is the only system that can process your Android, Apple, BlackBerry and Windows devices all at the same time on the same Icombine module. No need for dedicated equipment or redundant computer systems. 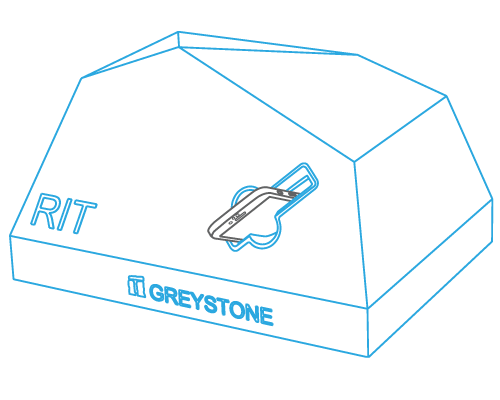 Supports over 1000 smartphone devices from every major manufacture. 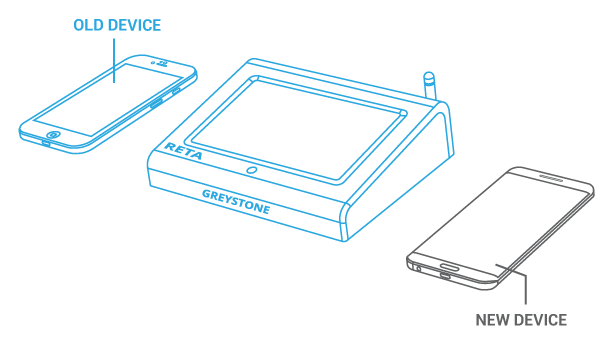 The RETA technology is a complete mobile device evaluation hardware solution in an easy to use, battery operated device. This system would be at home in a point of sale location as well as in a repair depot. 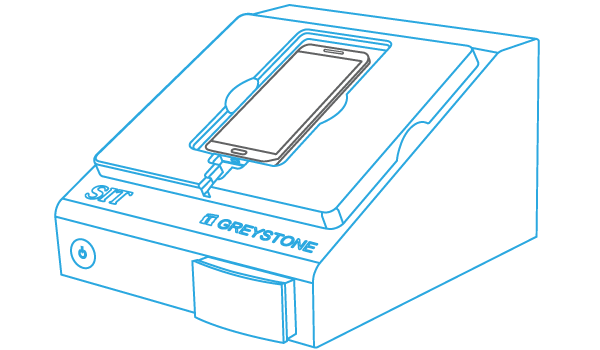 This stand-alone unit is capable of performing extensive diagnostic tests, quickly transfer content between same or different device operating systems, secure data erasure with solution has been certified by ADISA, and provisioning on the mobile device. The RETA utilizes a full touch screen and runs on a lithium ion battery to maximize usability and mobility. Supports over 1000 smartphone devices from all major manufactures. 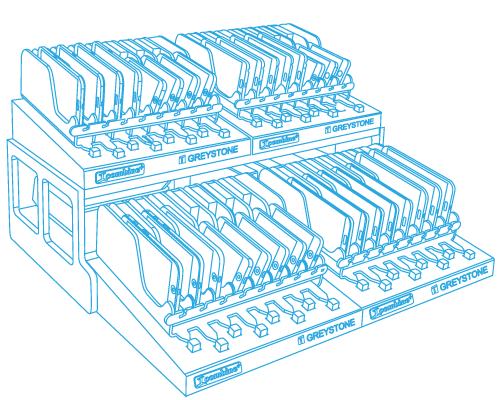 The Izap is designed for retail store use. 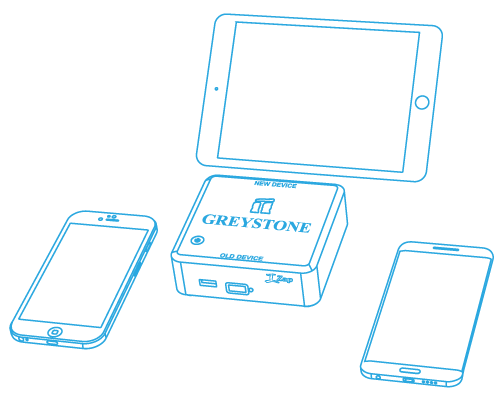 This is a complete mobile device evaluation tool designed to be portable and feature packed. All information about the customer and the mobile device is collected and available to comply with most local “Pawn Shop” laws. Cross platform compatibility is built into this system, Android, Apple, BlackBerry and Windows devices are supported. This light weight portable system is designed for on-the-go associates, yet packed with cutting edge technology. The customer data may be transferred from their old device into their new device. The device functionality can be measured to determine the value of the device before it is traded in or sold to the store. Small and featured packed, this system will make any retail store an expert with mobile device buying. Supports over 1000 smartphone devices from manufactures such as: Apple, Nokia, Samsung, LG, BlackBerry, Casio, HTC, Motorola, Pantech, Sanyo, Sharp, Sony Ericsson, and more. 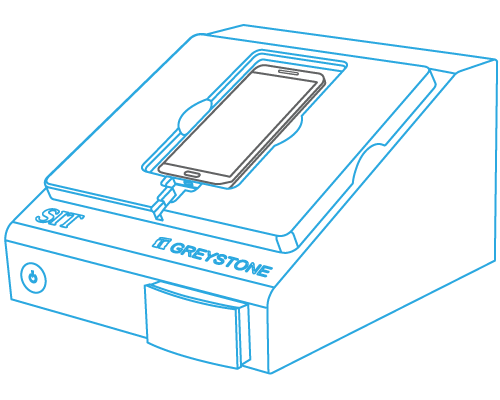 The Itest Chamber is a system that automates many of the functional tests performed on today’s mobile device. The Itest Chamber is a sturdy, compact unit that is capable of running extensive automatic tests on the camera, video record, LED / flashlight, proximity sensor, Wi-Fi, call and all audio functions. The capability of automatically testing these features on the mobile device will improve the experience for all users. The test results are sent to the cloud server where it may be retrieved on our easy to use Dashboard. Supports over 1000 smartphone devices from all major smartphone manufactures. The PCB Tester is designed for those situations where a mobile device has to be tested or erased but the only good useable part of the device is the PCB. If the LCD is broken and unuseable, the buttons don't work, the battery is dead, the ports are damaged beyond use, no problem. Remove the PCB and put it into the PCB Tester equipped with a good LCD, good buttons, good battery and reliable power supply, and good ports. Test and erase the PCB with data erasure solution has been certified by ADISAas easy as any new mobile device can be tested and erased. Connected to an AIO machine a full suite of tests are supported including 3D touch, front & back camera, call signal test, battery charge, GPS, headset jack, buttons, IMEI check, LCD, microphone, multi-touch, radio-signal strength, SD card detection, speakers, touch screen, video recording, Wi-Fi signal, internal speakers, motion sensor, proximity sensor, vibration motor test and more. Where cables plug into the pcb the PCB Tester is designed to minimize wear on the delicate sockets with EZGrip cables equipped with EZGrip handles aiding the test operator or technician to easily insert and extract the cables. The PCB Tester increase productivity through the use of known good parts, form fitted jigs to securely hold the pcb and cables designed to drop right into the correct socket in the correct location. 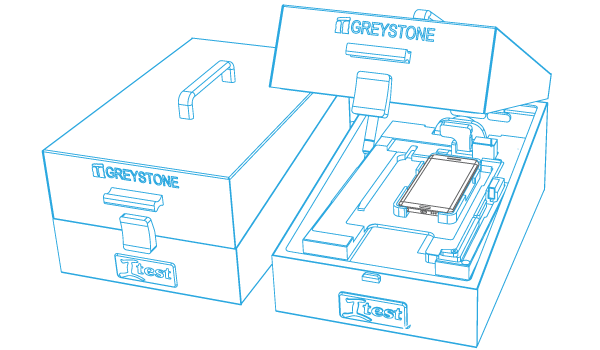 The PCB Tester makes the job of testing and erasing the mobile device PCB easy and efficient. The PCB Tester has custom fitted jigs available for popular mobile device pcbs, such as iPhone 6 and 7 and Samsung Galaxy devices. Any device can be supported upon request. Relying on powerful OCR algorithms to convert captured images to machine text and data. The RIT machine receives device information without requiring connection to a computer or the device to power on. This innovative system is capable of reading the Human readable information on the back of a mobile device, then parsing the information out to a computer in machine language. You no longer need to read an IMEI on the back of a device and type it into a computer. The data is analyzed and presented in industry accepted formats. The RIT system also reads bar codes in any orientation adding to the versatility of this system. 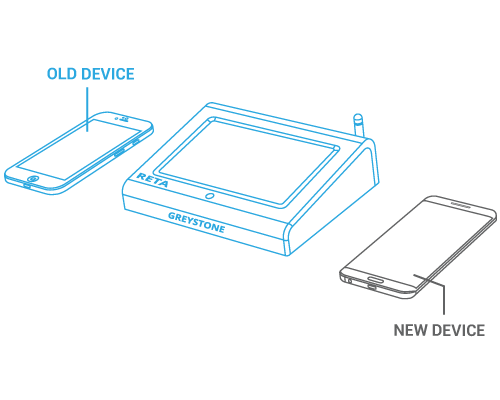 You may even connect a mobile device to the KIT system to read the internal information. 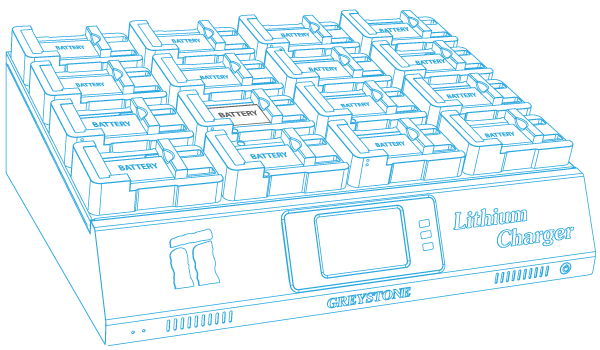 The KIT has barcode scanner emulation with programmable keystroke output via USB connection. The KIT provides complete productivity reporting, which is available on our cloud based Dashboard. 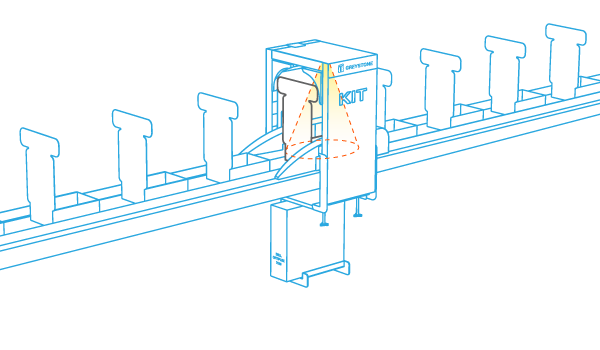 KIT is a QC machine utilizing machine vision to reduce the number of errors encountered from products not placed into boxes. 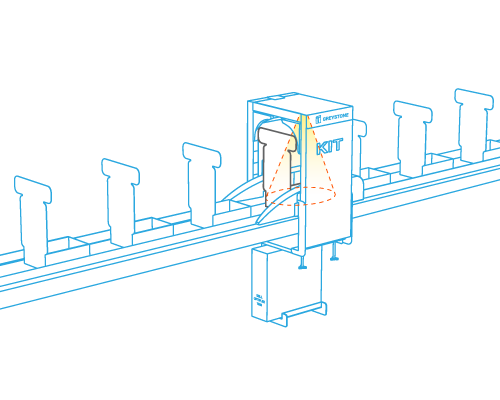 The use of a real time camera to detect if an item is in the box allows for “on-the-fly” QC of the box contents as it is carried along on a conveyor belt. This system is capable of tracking the quantity of product used as the build is progressing. 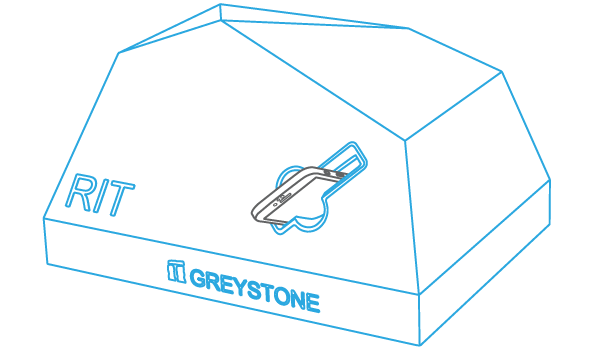 Optimization of the order fulfillment process is achieved by checking the contents of the package before the lid is sealed. Versatility of the systems allows it to be used on moving conveyor lines or in a stand-alone packing station. You may generate various production reports by retrieving data that is collected in our easy to use database. The system is fully integrated and is small, convenient, easy to use and accurate. SIT is a security machine that reduces stolen and missing devices from processing facilities. It pairs employee ID card with the internal IMEI of an employee’s electronic devices and sends an alert when an unaccounted electronic device attempts to leave the facilities. This prevents board swapping from customer devices into employee devices. Our simple database system tracks all employee devices coming in and out of the facilities. Visitors can be tracked and removed from the database when they turn in the visitor badge. The system is fully integrated and works through an iPad interface. Small, convenient, easy to use and accurate. The Lithium Charger is designed to handle up to 16 batteries at one time. 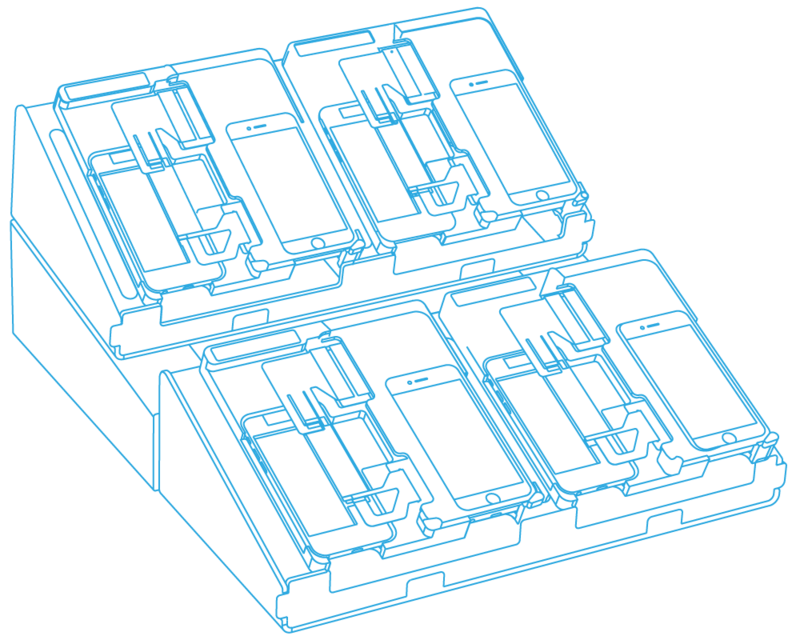 Batteries can all be the same or mixed models, each port will charge the battery independent of the other ports. Batteries used in today’s electronic devices have a larger capacity, the Lithium Charger will be able to handle these batteries up to 6000 mAh. The unique patented battery holder is designed to be easy to use and flexible. A “wake up” feature will put a quick high current charge on batteries that are “exhausted” or completely run down bringing the battery back to life. The target charge percentage is selectable to support your unique charging needs and times. Versatility of the Lithium Charger sets it apart from all other chargers on the market today. 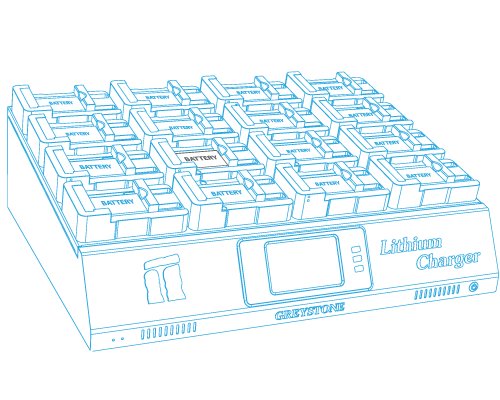 The Lithium Analyzer is designed to run “stand-alone” to test 12 batteries simultaneously. The batteries may be all the same or all different. 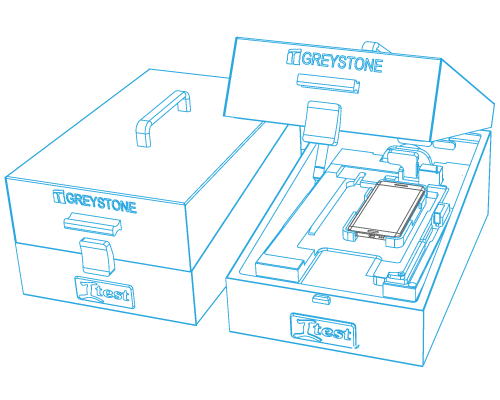 This system is capable of analyzing the large capacity (up to 6000 mAh) batteries that are used in today’s mobile devices. The system has an integrated function for protecting batteries and detecting the wrong electrode before and during the test. 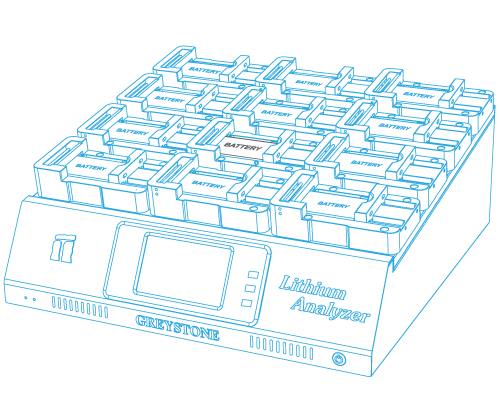 Fully self-contained analyzer has a 5 inch touch panel to control the type of test to run. Quick Test: Test and report the results of battery status (State Of Health - SoH) within 3 minutes. Charge all kinds of Li-ion batteries with Designed Capacity up to 6000mAh. Discharge: Discharge all kinds of Li-ion batteries with Designed Capacity up to 6000mAh. Refurbish: including the process of charging and discharging the batteries several times in order to increase the operational capability of the batteries that were not used for a long time. 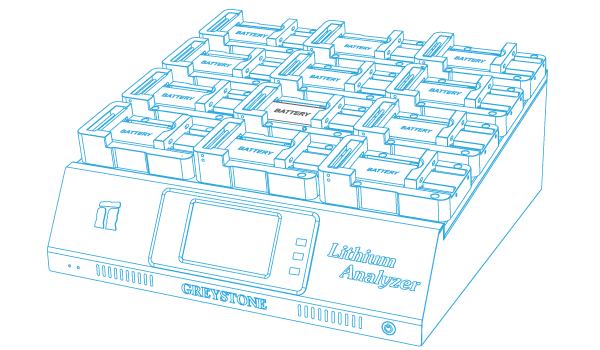 Analyze: Analyze the characteristics of batteries in order to create profiles for QuickTest function. Jump-Start: Activate the battery voltage was down. 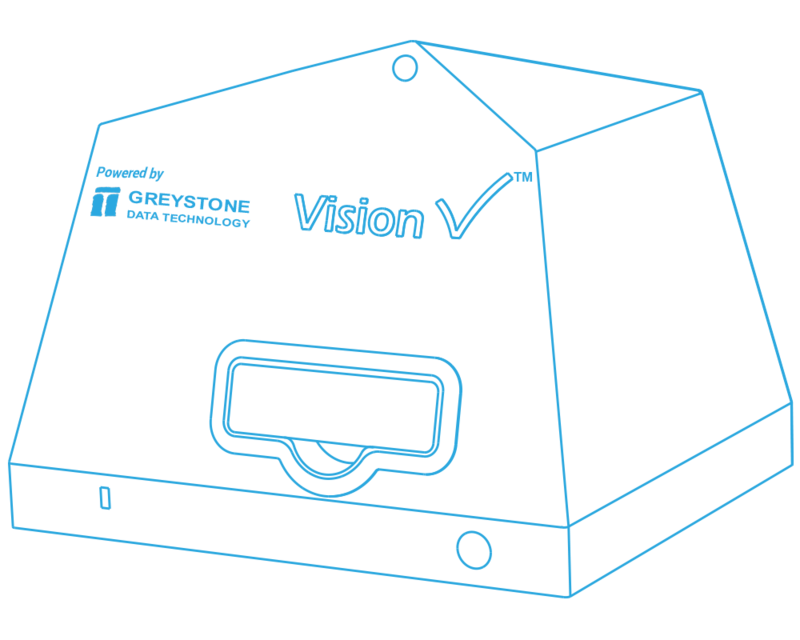 VisionCheck is a revolutionary quality control tool developed to eliminate human errors in the mobile device assembly process. This robust system utilizes advanced machine vision to identify assembly components such as screws, vibration motors, and cables and verifies the parts are installed properly in the correct locations. During the validation process an image of the device is displayed to the quality control operator with errors clearly marked for correction. The assembly validation process is completed in 10-15 seconds. The VisionCheck system can be used with a standard monitor-keyboard-mouse set up, or with an iPad for more portability. Interchangeable fixtures are available to support a range of device models.